What an exciting day. 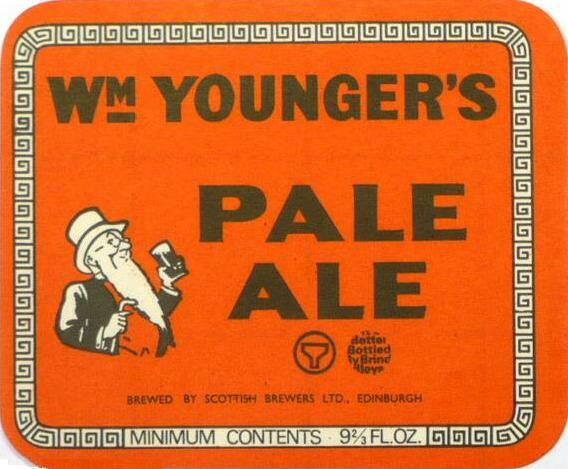 The first recipe in our Scottish series and what a corker it is: Younger's IPA from the 1860's. You may recall the tale of how I discovered XP was marketed as IPA. I'd seen the beer plenty of times in Younger's records, but it was only after stumbling on a presentation by Mitch Steele I realised what the beer was. You can't imagine how happy I was. You really can't. Younger's brewhouse names are so weird I needed help to decipher them. The traces of Empire are all over this beer. Other than a certain amount of Scottish malt, all the ingredients are imported. Mostly from outside the UK, except for some of the hops. This is a point I've made before but I'm going to ram it down your throats once more. From the middle of the 19th century, British brewing depended on foreign raw materials. It just wasn't possible to grow sufficient quantities in the UK to meet demand. Yet the style nazi way to define something as "English" or "British" is by the use of UK malt and hops. Even though beers actually brewed in Britain over the last 150 have almost always contained some non-British ingredients. 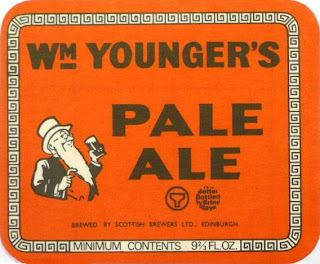 Breweries like Younger's would have struggled to achieve the size they did without the connection to the British Empire. Both as a market for their products and as a source of raw materials. That's why the hops-don't-grow-in-Scotland-so-Scottish-beer-couldn't-have-been-hoppy argument totally misses the point. Not just Scottish brewers, but the whole of the British brewing industry depended on imported hops. The internationalisation of brewing in Britain was surprisingly early. Beer went out and barley and hops came back. It was only possible because of Britain's massive trading fleet and ever-improving ship technology which reduced freight costs. These made it practical to ship grain from as far away as California or Chile. Document WY/6/1/2/21 held at the Scottish Brewing Archive. XP was clearly one of Younger's most important products. I doubt any English brewery outside Burton was brewing such a high percentage of IPA at this date. That's enough contextualisation for today. Over to Kristen for all the recipe details . . . . . Grist – Very simple recipe. Two pale malts. One of the recipes called for Non-UK malt for the big portion but all called for the small portion to be Chilean. Being fresh out of Chilean malts I chose to use the omnipresent Maris Otter for the big part and then a nice Canadian 2-row pale or the lighter however any continental pale would do nicely also. Hops – Two hops. Fuggles and Saaz. Fuggles do a nice job for the bittering but the Saaz steal the show. Be sure to get some nice Czech Saaz and not the US grown ones. Although nice, they have some meaty elbows that will really take away the elegance. If you like that sort of thing, don’t listen though. Yeast – The Thames valley really does a brilliant job here giving a little boost to the malt to support the vast amount of greenery in the beer. If you use a yeast that’s too dry, the only thing you’ll taste is hops. This really is one of the ones you can pretty much just choose your favorite yeast and be happy with it. There's also the military. McEwan's and Aitken's of Falkirk had substantial trade for the military. Not sure about Wm Younger's. I have all the necessary ingredients for that one! Excellent, will brew that sometime this month and write it up! Oaky, so this question has nothing to do with the Younger XP, but it is Let's Brew Wednesday related. Does anybody know how much 1 ounce of burt sugar (used as a colorant) will raise the SRM/EBC of 5 gallons of wort? Oh, and are black invert and burnt sugar essentially the same, or is burnt sugar closer to Invert No. 4? One of the problems with the idea of "beer styles" is that at their very core they can only talk about a snapshot of time. Clearly Scottish and English brewers had access to a huge variety of ingredients during the 1800's. So, was there a point in history distant enough that transport difficulties might have made hops rare in Scottish beers, but recent enough that there is a record of it? On another note-a potential problem for shipping companies is that while the majority of your profit may come from one leg of your journey, ships generally cant safely sail when empty, so you have to bring SOMETHING back to your point of origin. Chinese ships have been routinely going home with loads of scrap steel from the US for decades, to the point where now scrap steel is fairly scarce in the US. This makes it difficult for scroungers and helps to push people toward buying new...often from China. The SRM of treacle is around or about 150 , I would believe that burnt sugar would be close , how that would effect 5 gallons of wort wouldn't be much. By adding 1 oz ,it would fall in the neighborhood of 3 to 3.5 SRM because it would be 1 in 640 oz to 5 gallons. Hope that helps. Each are different. Proper burnt sugar (the Jamaican stuff anyway) has a bunch of caramel colorant added to it so its pretty damn dark. Straight burnt sugar is about 150-200 I'd guess so Artic is correct. I always use a pint of pils and do a few color tests to see how dark each different sugars are. I started reading this about a month ago and would love to try to brew some of these recipes. Is there a post explaining some of the unique aspects of brewing historic recipes? What are some of these ingredients and what are some substitutes? I know the LHBS doesn't stock a lot of these ingredients, can they be obtained from other sources? Edward, there are many (really loads) of old posts describing old brewing techniques. Too many to really point at one. Some ingredients are more problematic than others. Hops are no problem. Goldings and Fuggles have been around for a very long time. Malt is trickier, mostly because of the barley varieties, but also because of changes in malting techniques. Brown malt is the biggest problem. It's impossible to buy 18th century style brown malt. And I'm not sure how well modern brown malt matches that from the 19th century. The trickiest, surprisingly since it is still manufactured, are the invert sugars. It's impossible to buy them in quantities of less than a ton. So Kristen, If I do go ahead and use the Jamacian stuff, do you think an estimated SRM of 300-350 is about right? I'm trying to get a good, deep brown color for a Burton (starting at around 12 SRM) but I don't want to go to far and get black. That is to ay starting at 12 SRM and hopefully ending at around 20 SRM.